NYC is Blue: "Frank Lampard Day"
Last night, before the match, Frank Lampard was honored for his 300 career goals in a pre-game ceremony. The city honored him by proclaiming September 1, 2016 "Frank Lampard Day". Sporting Director Claudio Reyna presented him with a framed "300" jersey. 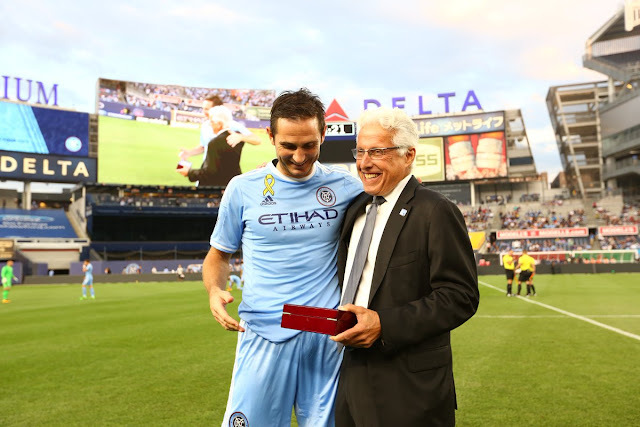 Marty Edelman, Vice Chairman of NYCFC, presented Frank with what was announced as a commemorative ring designed by the club. We didn't get a look at what was in the wooden box, though; I'd be very curious to see what the ring looks like. This was all just a warm-up for a really cracking match, complete with storybook ending that saw Frank the hero of his own day. With a 1-1 draw going into the closing minutes of the game, Frank showed why he has earned all the honors (not to mention that $6 million paycheck). He broke a 1-1 draw in the 85th minute with a strike to put New York City ahead. And when the visitors drew level again in stoppage time, Frank scored the 302nd goal of his career in the 93rd minute to seal the game and establish his legacy with the club. Given all the struggles, the false starts, and all the naysaying from the press, this must have been an incredibly gratifying night. Congratulations, Frank. You earned it.